I was delighted to attend the assembly of The Patch Primary School last week to present them with the Shire of Yarra Ranges HabitAT award for 2013.
are very proud of their achievements and they should be. and our future's looking bright with these young leaders. The Patch took out the category for best HabitAT Plan in the Shire, for the work done completed by students planning short and long term actions to ensure the future protection and enhancement of the natural environment in their school grounds. It's been a whole of school effort with every grade participating in some way, but the Grade 3 and 4's undertook the detailed work of developing the plan. The plan includes the development of wildlife corridors in the school grounds and the enhancement and expansion of a variety of ecologically diverse zones, including a fern gully, wetlands, open indigenous plantings, mountain ash gully, bird & butterfly attracting zones and additional productive gardens. It's an impressive effort from the whole school community, and teacher Michelle Rayner has been a driving force behind the Learning for Sustainability program at The Patch. The Shire awards 3 schools a year for either a HabitAT Census, Plan and Action award. 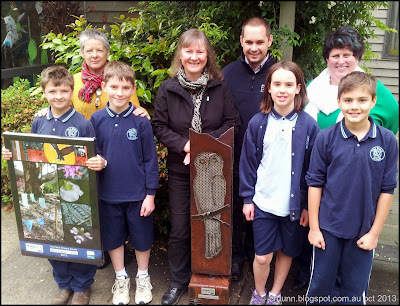 The Patch Primary took out the HabitAT Census Award in 2012. The awards are part of the Shire's Learning for Sustainability program which aims to help schools gain a stronger understanding of their ecological footprint , how they use resources, but most of all how students, staff and members of the broader school community can make a difference working towards a more sustainable future. Congratulations to all at The Patch Primary, you really are an exemplary model of sustainability and rightly proud of your achievements. it's in the plan, but is it in the budget?